LaRue Tactical Suitcase Rifle (“Suitcase Gun”) 14.5” 7.62mm NATO/.308 Win. 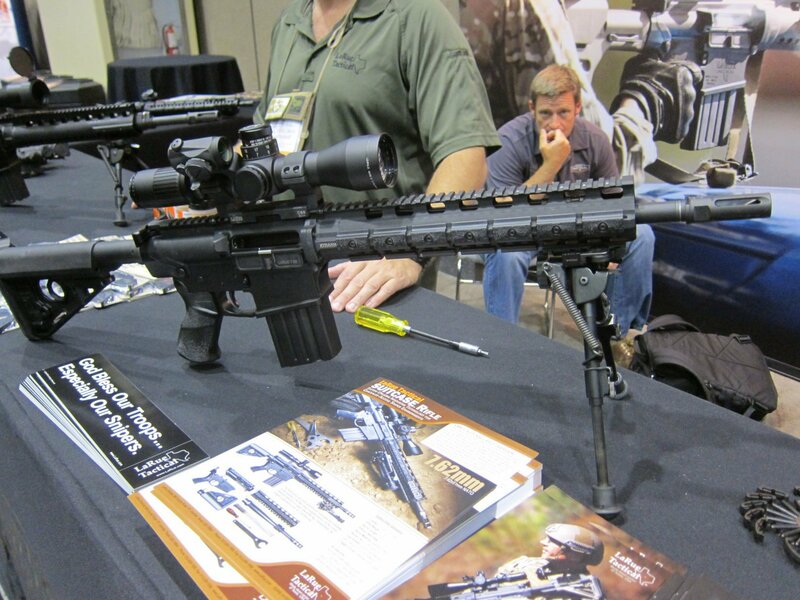 Takedown PredatOBR AR Carbine at NDIA Joint Armaments 2012 (Range Video!) | DefenseReview.com (DR): An online tactical technology and military defense technology magazine with particular focus on the latest and greatest tactical firearms news (tactical gun news), tactical gear news and tactical shooting news. 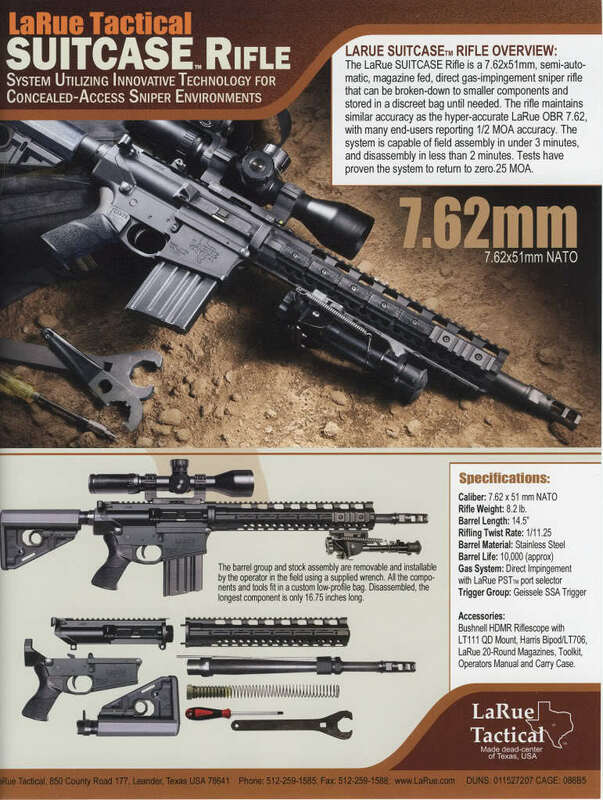 All photos and video clips contained in this article (except the LaRue Suitcase Rifle Data sheet image at bottom) were shot by DefenseReview.com, and are copyrighted. DefenseReview.com owns the copyright on these photos and video clips. The photos and video clips were shot with a Apple iPhone 4S smartphone with 8MP (8-megapixel) still camera and 1080p HD video camera. DefenseReview (DR) got to fire the LaRue Tactical Suitcase Rifle ;("Suitcase Gun") 14.5”-barelled 7.62mm NATO (7.62x51mm NATO)/.308 Win. 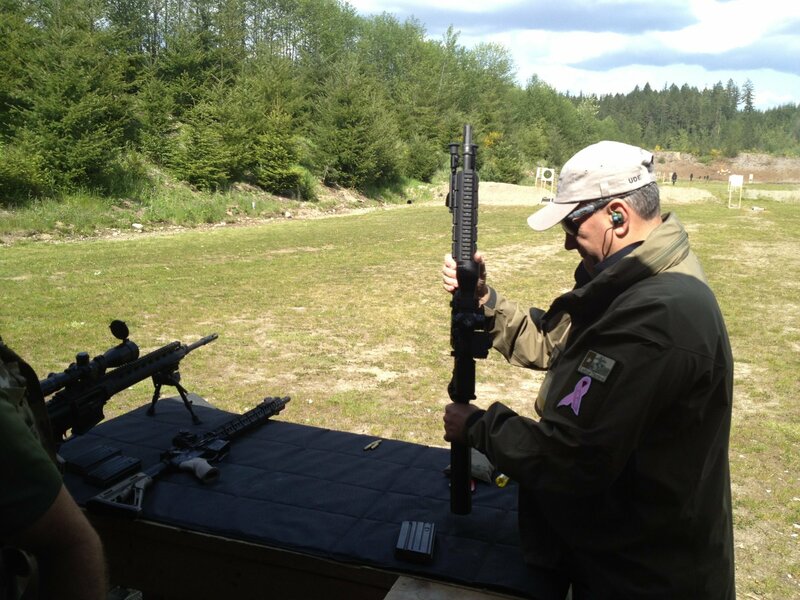 takedown PredatOBR ;AR carbine at NDIA Joint Armaments Conference, Exhibition & Firing Demonstration 2012 Range Day last week, and we really liked the weapon. The gun we test-fired was outfitted with a Leupold 3-18×44 Mark 6 34mm Riflescope first focal plane tactical scope with either a Tremor 2, H-58 or 7.62 CMR-W reticle and fast focus eyepiece, as well as a 45-degree-offset mounted Aimpoint Micro T-1 Red Dot Sight. The mount for the Aimpoint combat optic was a LaRue Tactical mount, of course. 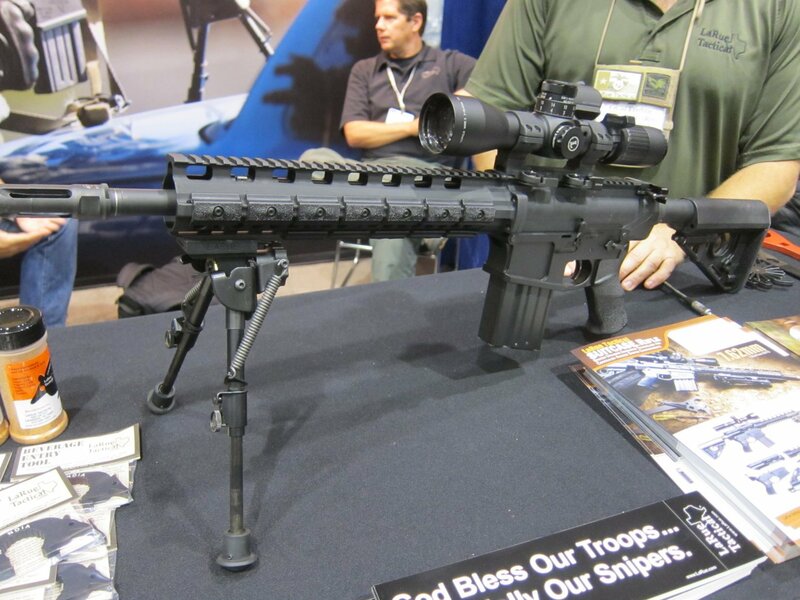 The LaRue PredatOBR 7.62 configuration combines the LaRue PredatAR 7.62’s upper and lower receivers and rail system with the LaRue OBR 7.62’s (Optimized Battle Rifle 7.62) barrel and PSTTM gas operating system, which is a direct gas impingement (DGI) operating system. We were only able to put a few rounds through the Suitcase Rifle, but the gun shot like a dream. We also witnessed a number of other people firing the weapon, and it ran flawlessly as far as we could tell. It also looked good, which is important for a gun at this level. 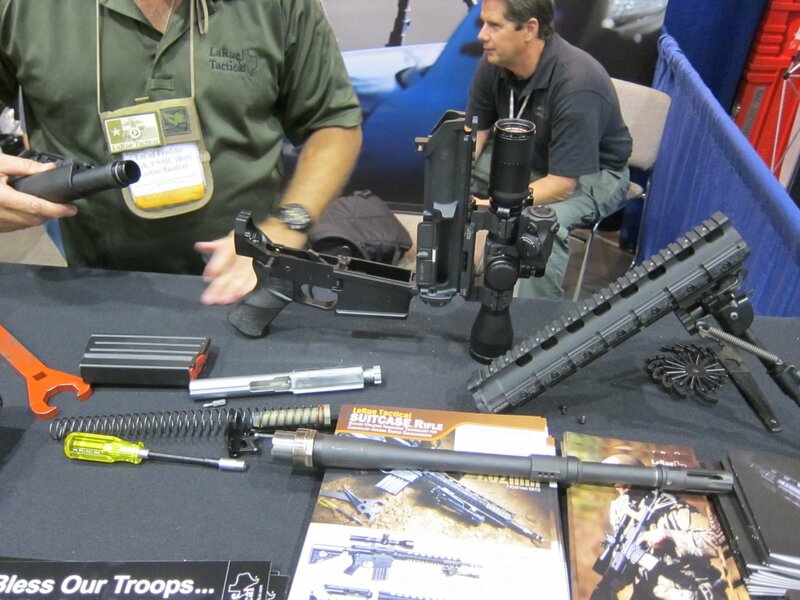 A day or two earlier, Freddie Blish and Mark Fingar of LaRue Tactical were kind enough to disassemble the rifle for us on the exhibition floor in order to demonstrate the weapon’s takedown aspect. The LaRue Suitcase Rifle is one cool carbine, and definitely worth a look for anyone interested in a 7.62mm takedown tactical AR carbine. In the first/top video below, you can see your humble correspondent shooting the OBR 7.62 first, and then the Suitcase Rifle. Next: Happy Memorial Day, and Thank You to Our Veterans and Troops!